Best Research Paper Award, III Congresso Internacional de Controle e Políticas Públicas, second place, Instituto Rui Barbosa, 2017. ANAC 10 ANOS Award. Brazilian National Civil Aviation Regulatory Agency, 2016. VII SOF Award Honorary Mention. Brazilian Federal Budget Secretariat, 2015. XIX Treasury Secretariat Public Finance Award. Brazilian Treasury Secretariat, 2014. Honor received by Fábio Ávila. Robert D. Cooter Award Honorary Mention, ALACDE, 2014. VIII SEAE Award on the Regulation of Economic Activity. Ministry of Finance, 2013. 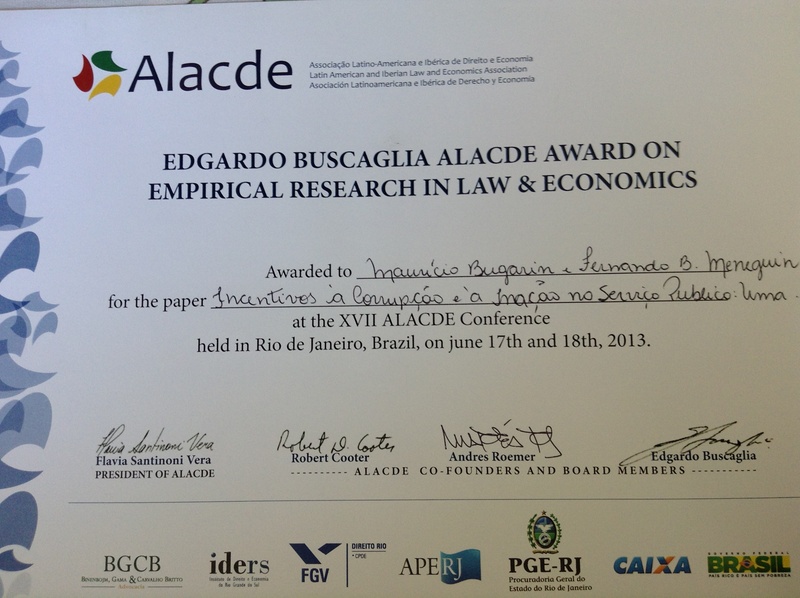 Edgardo Buscaglia Award for Empirical Research in Law and Economics. ALACDE, 2013. Presentation of research on Electoral Campaign Finance at the Brazilian Supreme Court, 2013. XVII Treasury Secretariat Public Finance Award. Brazilian Treasury Secretariat, 2012. Robert D. Cooter Award for Scholarship on Law and Economics, ALACDE, 2012. Member of the Standing Committee of the Latin American Chapter of the Econometric Society. 2007-11. XIII Treasury Secretariat Public Finance Award. Brazilian Treasury Secretariat, 2008. 2007 George Stigler Research Award. Ibmec São Paulo, 2008. SEAE Prize in Economic Regulation. Honor received by Bruno Alvarenga, Brazilian Ministry of Finance, 2007. 2006 George Stigler Research Award. Ibmec São Paulo, 2007. I National Health Economics Award. Brazilian Health Ministry, 2005. IX Treasury Secretariat Public Finance Award. Brazilian Treasury Secretariat, 2004. VIII Treasury Secretariat Public Finance Award. Brazilian Treasury Secretariat, 2003. VII Treasury Secretariat Public Finance Award. Honor received by Adriana Portugal. Brazilian Treasury Secretariat, 2002. 2002 Haralambos Simeonidis Award. Best article by a Brazilian author award with the paper “Vote Splitting, Reelection and Electoral Control: Towards a Unified Model”. ANPEC, 2002. VI Treasury Secretariat Public Finance Award. Brazilian Treasury Secretariat, 2001. V Treasury Secretariat Public Finance Award. Brazilian Treasury Secretariat, 2000. IV Treasury Secretariat Public Finance Award. Brazilian Treasury Secretariat, 1999. “An Incomplete List of Teachers Ranked As Excellent by Their Students“, Fall 1996, Spring 1997 e Fall 1997, University of Illinois.